Home » All of Deb’s tales of travel and tech » Packing » Pack an umbrella for travel? Pack an umbrella for travel? Into all travels some rain must fall? You may be a short-term traveler and traveling outside of the rainy season so maybe not. But… if you travel long-term or off-season, rain may well be a part of travels. And if you tend to be an umbrella-type person, you might want to pack one for your travels. Only, then you have the issue of carrying that umbrella — further stuffing your bag and adding to its weight. As you pack, you may find yourself wondering….what are the chances that it’ll actually rain in that place when I’m there? Do I really need to bring an umbrella? As a traveler, there were too many times having to carry my backpack was already bringing me to tears, so I resisted packing an umbrella. But on normal walking days when I’m not carrying my backpack between locations, I sometimes find an umbrella more appealing than a raincoat or poncho, so I’d actually buy an umbrella when I needed one, then give in an buy another time. This changed when I discovered the Fjord Folding Trekking Umbrella by Innate. It’s the thinnest in diameter and lightest umbrella I have found. Yet, it’s durable. Interestingly, I discovered it as I was deep in my cut-it-lose weight and size cutting. An umbrella wasn’t in those plans! 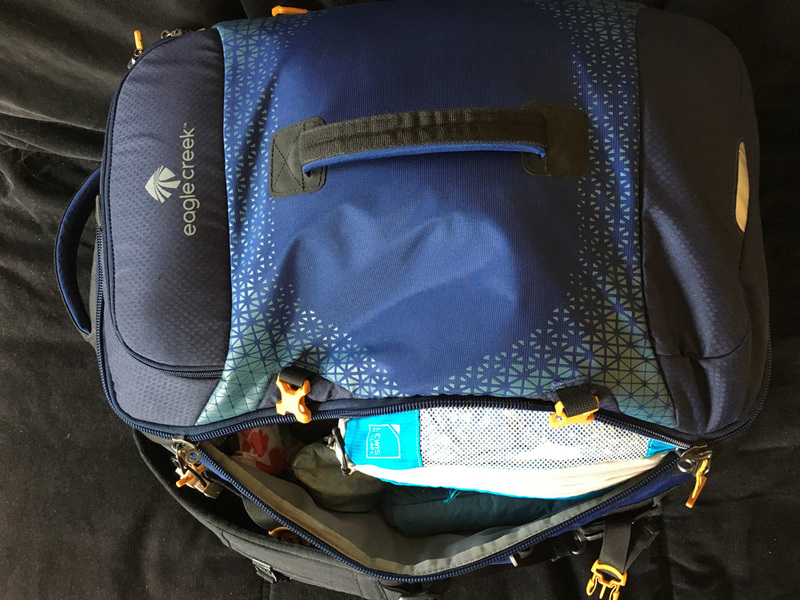 I was at the International Travel Goods show and visiting Innate Gear because of other products when I discovered this one. When I saw Fjord Trekking Umbrella, I knew I wanted to try traveling with this umbrella. The canopy fabric was amazingly thin! The official specs call it “rainproof lightweight polyester” but it also looks to me like it’s ripstop. The lines are quite close together which would provide great protection against tearing. As you do, each rib’s hinge pops into place. At first, I was nervous about this so I used 3 fingers to help some of them pop into place, but that wasn’t necessary. Had I kept sliding the ring, they’d have popped into their fittings on their own. When you’re ready to pack it away again use 3 fingers to pop the hinge back into folding position. Look closely. My Innate umbrella is tucked beside my bottom Lewis N. Clark packing cube in the front of my EagleCreek backpack. Innate also says the ribs are fiber-reinforced for strength. Because it is a thin umbrella — about 1.75″ across / 6″ circumference — even cutting my bag from 63 liters to 50, I was able to easily fit this in. The weight (185g/6.6 oz) wasn’t much of a concern. And so it came with me. would it really work for me when I needed it? It rained lightly during my Sicilian September. It rained lightly during my October in Slovenia and more in Bratislava, Slovakia. So far, so good. I was happy with my choice. To report fully to you though I had to wait for a serious rain. Gusty rain. The kind that is pushed by wind. Umbrella canopy-bending, ribs-twisting wind. 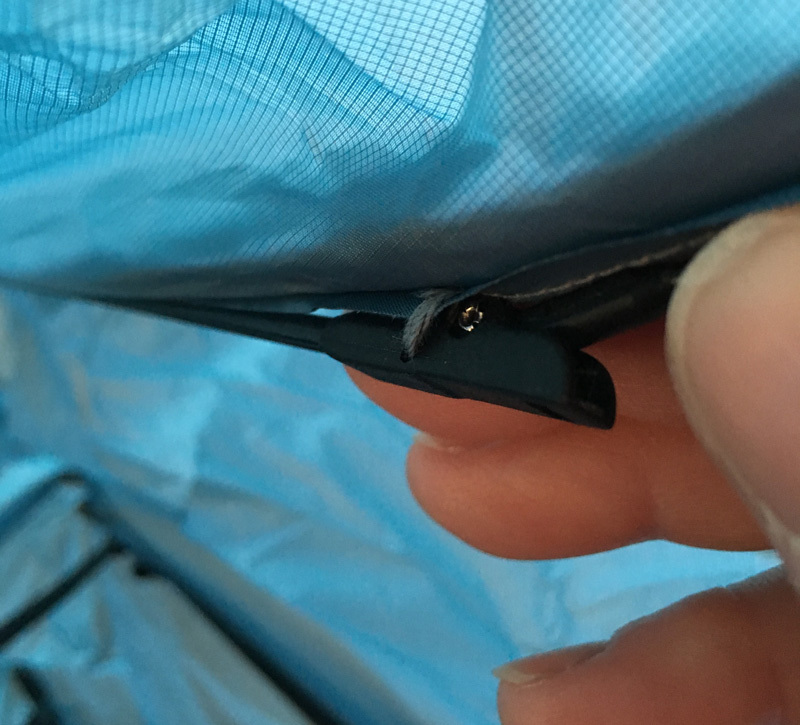 In December and January, my Fjord Folding Trekking Umbrella had its big test. Tests, actually. First, it kept me dry as it withstood the harder rains of the northern Israel mountains. Then it joined the cacophony of storm sounds on Jaffa Street, Jerusalem, as winds blew not just hard rain but everything on the street from boxes to people. 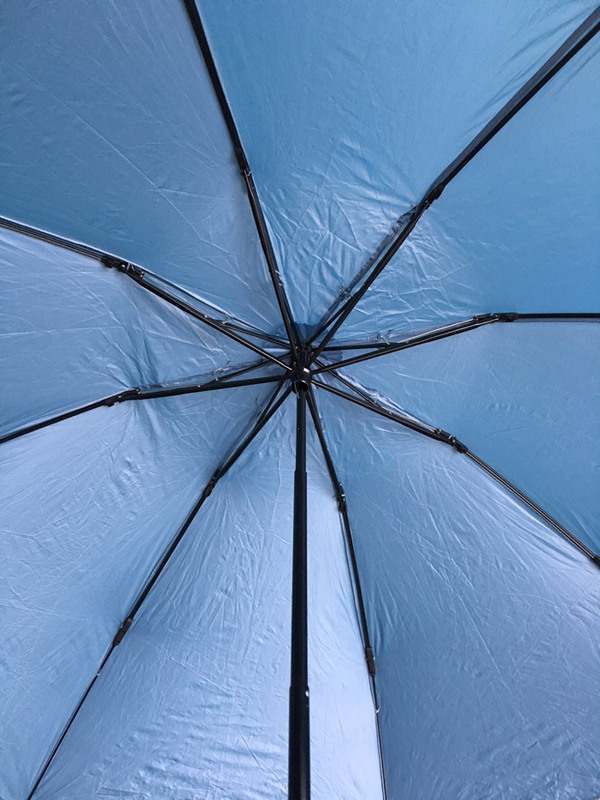 The wind did invert the canopy at the hinges after a while, but this light travel umbrella was in good company as every umbrella in sight, even the ones that don’t have a folding canopy, also flipped outward. I simply pressed it back into shape and continued my mile-long storm challenge, thoughts of Mary Poppins in my mind. The canopy actually flipped a few times in this relentless wind. None of the ribs twisted though. I arrived at my destination as dry (or wet) as the next guy. Happily, this mighty umbrella held its own and lived to protect me another day, then another. It protected me in Cyprus next but those rains didn’t present such a challenge. I’ve had major brand name automatic umbrellas whose canopy tore from the shafts. Granted, that’s repaired by simply replacing the treads that tie it down. Point is though, that the Fjord Folding Trekking Umbrella’s treads held fast. I also liked the rubbery handle. I was able to slide my hand through the wrist strap and hold that handle well. The Fjord Folding Trekking Umbrella remains a tried and true travel companion. If you’re into carrying an umbrella to shield yourself from the sun, you’ll want to know that this canopy is UPF 20. You may wonder about the need to stop and touch each rib hinge as you close this umbrella. When I came in from the rain, I put it down to dry just like any other umbrella. I left it closed slightly, but not folded until I went out again, allowing it to dry. I only needed to push each of the eight hinges upward with my thumb and index finger when I was fully done using it. Each just typically takes seconds. 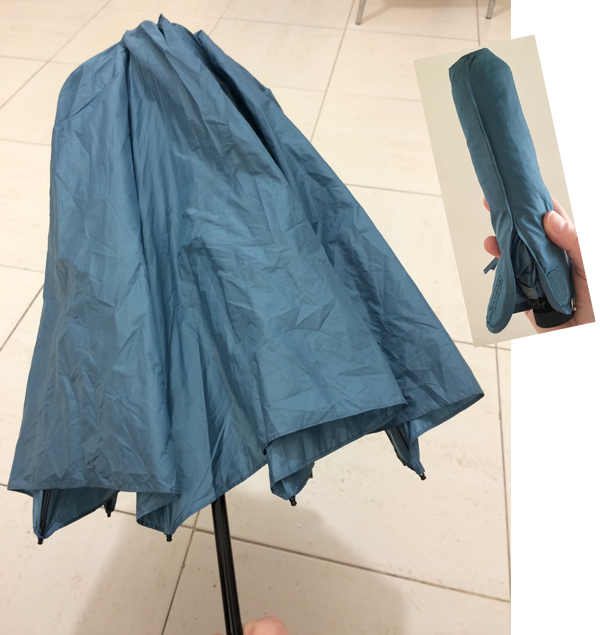 One thing I liked about how thin this umbrella is is that I was able to fold it back to very close to its original size again and that the sleeve slides on easily. There are other umbrellas that are called wind-resistant that may actually not invert in high winds. However, they tend to be double the weight. Great for your car or briefcase perhaps, but if you’re trying to live out of a single bag they might not be worth their size and weight. I have not tried the umbrella of the other travel brands I have come to trust. If you’re shopping for an umbrella to pack for your next travels, you might also look at one by Lewis N. Clark (10oz) or Sea To Summitt (they have two). My ideal umbrella would be transparent so I could pull it low as I brave the driving wind. Remember the bubble umbrellas of the 70s or 80s? But for now, this remains a rainy-day dream until a transparent lightweight ripstop fabric comes along. The Canopy provides 3′ 3″ (100 cm) arc of coverage. Rubberized grab disc with comfortable jacquard woven wrist strap. Telescoping tempered aluminum shaft sections. Unique canopy folding design keeps bulk and weight down for trekkers. Wind-stable construction thanks to eight durable, fiber-reinforced canopy ribs. Storage sleeve for stowing after wet weather use. Canopy coverage uses a rainproof lightweight polyester fabric. Provides good UV protection with UPF of 20.